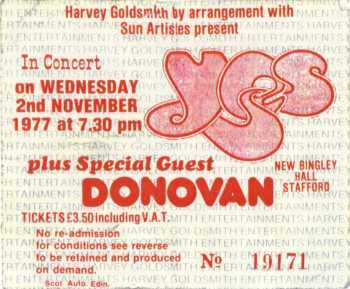 This was the first time I saw Yes, as a fresh faced 18 year old. Incredible experience, never forgotten. Awaken live at my first Yes concert, what more can I say! Oh, and Jon's quip before playing Wonderous Stories was "This is the song that made us famous". I'm sure I remember the band playing Gates of Delirium as well? Yes, I distinctly remember the insistence that everyone sit down before the concert started. At the front it was the usual concert crush, then everyone had to attempt to sit in the few square inches of space they had previously been standing in. Bodies ended up being piled three or four high. An awful, horrendous venue - a tin cattle shed, with concrete floor, on a freezing wet November night. The Yes sound was full of echo and treble and it was impossible to know how well they played. Whatever possessed them to book such a venue? I remember Chris having trouble with his amps but I was sure it was during Parallels. Jon did the tour song mentioning various places in England and asking, in the lyrics, if anyone was from these places. There was a great cheer from the crowd when he sang "Accrington". the concert was late starting, due to a power failure and as we were all waiting outside in the rain we could hear what we thought was thunder but it was coming from inside the Hall. once inside we were told that the concert would not start until everyone was sitting down. Donavon was greeted with an unwelcome reception from the audience, but he deserved better. I can distinctly remember seeing Rick taking a peek from behind the curtain, the atmosphere was truly electric as soon as we heard the first bars of the Firebird Suite. Time may cloud the memory but it was nearly a quarter of a century ago! Having said all that it was a very memorable night. At the Bingley Hall gig in November 77 Yes did play Colours of the Rainbow because Chris Squire was having trouble with his amplifier.Jon Anderson went to the other side of the stage to sing to take attention away from the road crew. 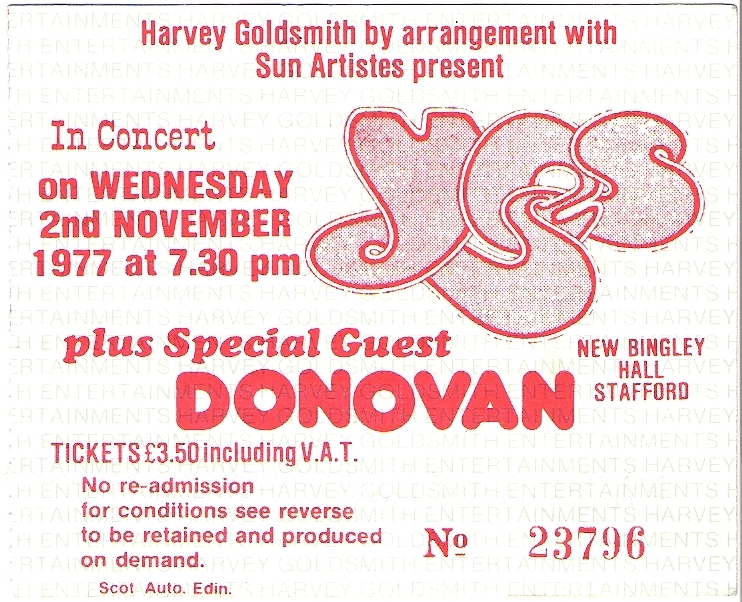 Yes did NOT play Time And A Word or Colours Of The Rainbow at Stafford (not on 2 November). 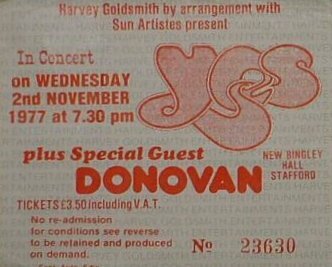 As I recall I was very disappointed that they did not play anything earlier than the Yes Album and I was also disappointed that they did not do any solo's. Apart from that they were brilliant. The lasers and back drops were just right, not as overpowering as in earlier concerts i.e. Topographic & Relayer tours. Yes did definitely play 'Time and a Word' in the Stafford Bingly Hall show UK show just before Going for the One...no question. I was there and one remembers these things. Jon made a joke just before 'Wondrous Stories' about 'Top of the Pops ' which was a BBC Music show dedicated to top 30 singles of which one was Wondrous Stories. The Bingly Hall was a 'cattle market' with matting on the floor ... no seats ! Pink Floyd played there too during the seventies.....The stage was very large ..ideal for all the bands kit.